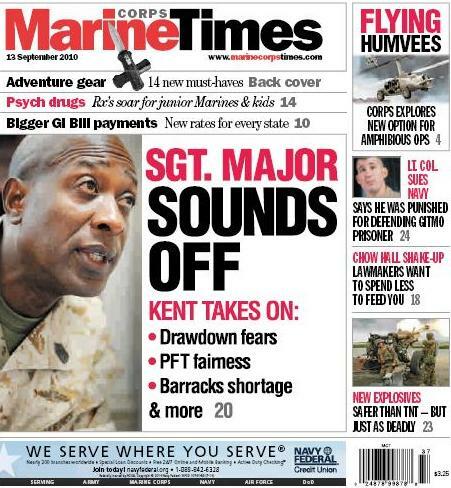 This week’s Marine Corps Times cover story reintroduces Marines with someone who many of them know well: Sgt. Maj. Carlton Kent, the service’s top enlisted adviser. In a 40-minute interview last week in his Pentagon office, Kent sounded off on a variety of topics, including drawdown fears in the Corps and what recommendations senior enlisted Marines pushed up to Commandant Gen. James Conway this year after the 2010 Sergeants Major Symposium, held this summer in National Harbor, Md. Historically, suggestions made out of the symposium have a way of finding their way into Marine Corps policy, so it would hardly be a surprise to see that happen again. Kent also briefed Marine Corps Times on his recent trip with Conway and two other general officers to Afghanistan. They visited about 15 forward operating bases and combat outposts in two days in southern Afghanistan, spending time with everyone from commanders at Camp Leatherneck to members of Marine Corps Forces Special Operations Command, Kent said.